Poe was born in Boston in Boston in 1809, although he went to Virginia soon afterwards. A favorite target of Poe’s criticism was Boston’s then-acclaimed poet, Henry Wadsworth Longfellow, who was often defended by his literary friends in what was later called “The Longfellow War”. Poe accused Longfellow of “the heresy of the didactic”, writing poetry that was preachy, derivative, and thematically plagiarized. Poe correctly predicted that Longfellow’s reputation and style of poetry would decline, concluding that “We grant him high qualities, but deny him the Future”. “We grant him high qualities, but deny him the Future” — is that prescient or what? 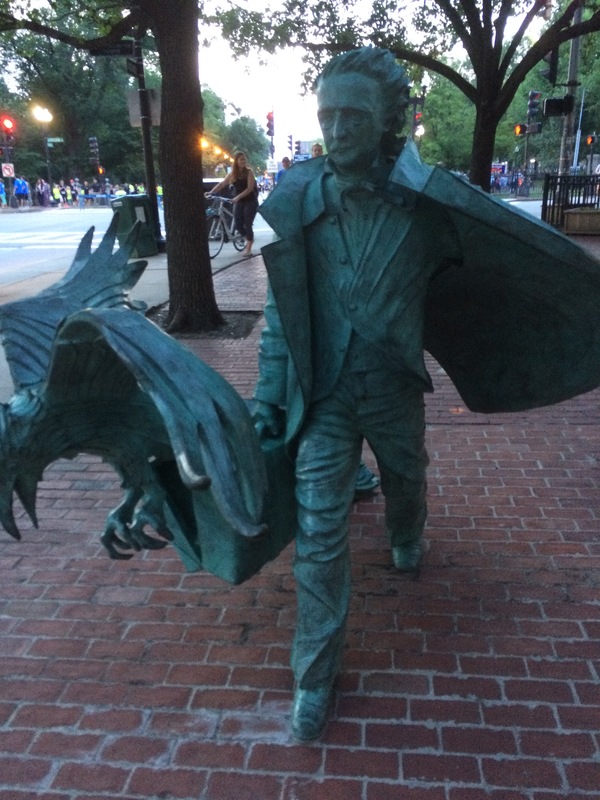 Here’s more about the Poe statue. The road race, you ask? Don’t ask. Here’s a photo of the pack going into Kenmore Square. Notice that my part of the pack isn’t exactly “running”. 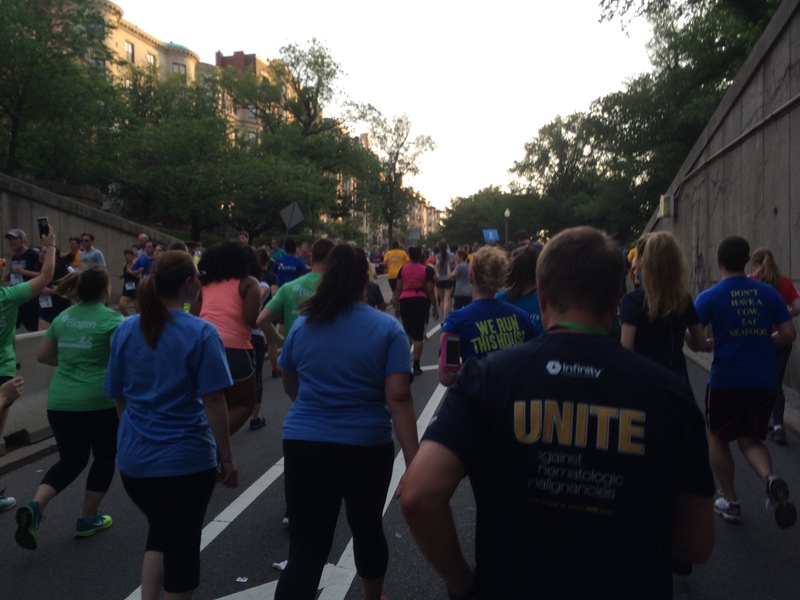 The folks heading in the other direction, back from Kenmore Square toward the Common–they’re running. Sheesh. 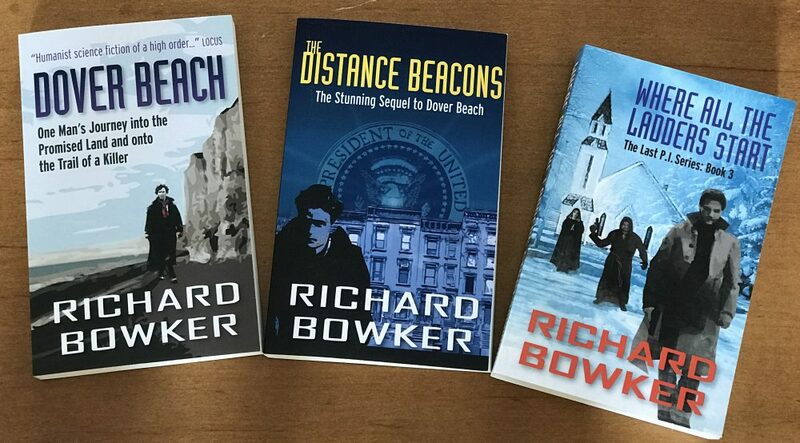 This entry was posted in Reading, Writing and tagged Edgar Allen Poe, fiction, horror, poetry, running, writers, writing by Richard Bowker. Bookmark the permalink. A persistent rumor around the Lowell area purports that Poe frequented the Old Worthen tavern. Even if it’s not true the place warrants a visit, if only to see the old high back booths, each of which is covered in carved engravings from generations of college students, and the pulley and belt fan system. Interesting — I didn’t know that. And how are you doing, John? Didn’t realize Jake’s was still around. Did you have bratwurst and porter? I had a burger and a Harpoon IPA (or two). So sue me. No, wait — one lawsuit is enough for a week.